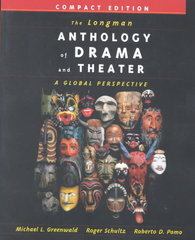 Longman Anthology of Drama and Theater, The: A Global Perspective 1 Edition Divided into three parts, this brief, chronologically-organized, fully-integrated drama anthology offers a global emphasis and extensive critical and historical material of 23 indispensable plays. No other anthology offers such a richly varied selection from the traditional Western canon, Asia, Africa, Latin America, and the Caribbean. This anthology contains many examples of rituals, ceremonies, and folk customs. The role of the storyteller is examined and chronicled to illustrate the impulses that have prompted humans to create theater. Center Stage Essays present dramatic descriptions of special performances, in many cases, the first performance of a well-known play. Spotlight Essays identify and discuss the wide variety of staging conventions of particular theaters. Forum Essays present important critical documents by critics, theoreticians, and theater artists. Lavish maps and annotated timelines familiarize the reader with different cultures and periods. Each play is introduced by a thorough headnote; each includes in-depth biographical information about the playwright and the historical context of the play. Photographs and illustrations help the reader visualize the performance of the play they are reading. For anyone interested in drama and theater.